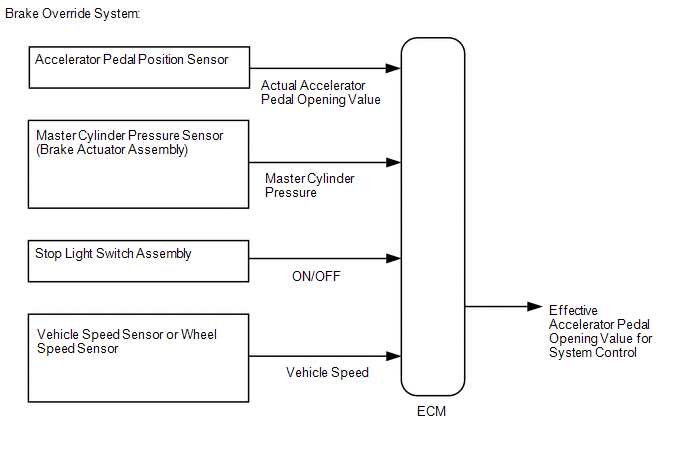 When the vehicle is being driven, depressing the accelerator pedal sensor assembly and brake pedal will activate the brake override system to restrict driving torque. The conditions for activating the brake override system as well as the items that are controlled are explained below. When the accelerator pedal and brake pedal are depressed. The vehicle may not enter the brake override system control due to the relation of the accelerator pedal angle and the vehicle's speed. When the vehicle speed is extremely low, the accelerator opening value used when controlling the engine is reduced more than normal. During control, the Accelerator Position value in the Data List will be lower than normal. When the vehicle speed is not extremely low, the accelerator opening value is forcibly lowered to a fixed value. During control, the Accelerator Position value in the Data List is forcibly reduced to a specified value regardless of the actual accelerator opening value (Accel Sens. No.1 Volt %). When the brake pedal or the accelerator pedal returns to some degree. Drive at 10 km/h (6.25 mph), depress the accelerator pedal by 1/2 to 3/4 and keep it in that position. Under these conditions, if the engine speed decreases to 1000 rpm when the brake pedal is depressed, then the brake override system has been activated. When carrying out the inspection, use a place where you are able to carry it out safely and also pay close attention to your surroundings. Also, when driving make absolutely sure that all road traffic laws, such as speed limits, are observed. Under normal conditions, the Accelerator Position value changes in response to the Accel Sens. No.1 Volt % value. For more information on the numerical values, refer to the Data List (See page ). If the Accelerator Position and Accel Sens. No.1 Volt % values in the Data List diverge and the Accelerator Position value in the Data List is fixed even though Accel Sens. No.1 Volt % is changing, check that this control is activated (use the Techstream data saving function to record data while driving the vehicle and then confirm it after driving is completed). The brake override system restricts driving torque if the brake pedal is depressed when driving with the accelerator pedal depressed. If a customer reports experiencing loss of torque after the accelerator and brake pedals have both been intentionally depressed, explain to the customer that this is not a malfunction, and that the customer should avoid depressing both the accelerator and brake pedals at the same time. Example: While operating the accelerator pedal, the customer uses their left foot to operate the brake pedal. (c) Enter the following menus: System Select / Health Check. (c) Enter the following menus: Chassis / ABS/VSC/TRAC / Data List / Master Cylinder Sensor. (d) Read the value displayed on the Techstream. (e) Check that the brake fluid pressure value of the "Master Cylinder Sensor" observed on the Techstream changes when the brake pedal is depressed. When the pedal is depressed, the voltage displayed on the Techstream increases. (c) Enter the following menus: Powertrain / Engine / Data List / Stop Light Switch and ST1. (d) Check the Data List indication when the brake pedal is depressed and released. (a) Inspect and adjust the brake pedal (See page ). If the stop light switch turns on too late, the start of brake override system control may be delayed; if it turns ON too soon, brake override system control may begin too early, so conduct inspection of the brake pedal and stop light switch assembly. (c) Enter the following menus: Powertrain / Engine / Data List / Gas Throttle / Accel Sens. No.1 Volt % and Accel Sens. No.2 Volt %. For numerical values of Accel Sens. No.1 Volt % and Accel Sens. No.2 Volt %, refer to the Data List (See page ). (d) Enter the following menus: Powertrain / Engine / Data List / Vehicle Speed. When performing a drive test, obey all speed limits and traffic laws. Data can be captured relatively easily by using the snapshot function in the Data List. Confirm the data after performing the drive test. (d) Enter the following menus: Chassis / ABS/VSC/TRAC / Data List / FR Wheel Speed, FL Wheel Speed, RR Wheel Speed and RL Wheel Speed.